“I’ve seen chords like G7 and C7 in some songs I’m learning. What are these?” Chords like these are based on major chords. For the uninitiated, major chords are those with just a letter for their name, like C, A, G - even Bb or F#. They have a bright, happy sound - and songwriters use them in all styles of music for their upbeat vibe. Well, there’s some theory here but we’ll try and keep it as brief as possible. If you break down a G major chord you’ll find a mix of G, B and D notes; to turn G major into G7 you have to add an F note. Now, F# is the seventh note in the G major scale, so, as we’re using F in our chord, not F#, we give our 7th a special name: the dominant 7th. It’s an unusual name but it reminds you that you’re changing the seventh note of the scale. It’s actually much harder to learn the theory than it is to play the chords - so don’t worry if you don’t understand it just yet. Try this trick to find the dominant 7th of any major chord you’re playing. 1. Start on the root note of your chord 2. Move 10 frets higher up the same string - this is the dominant 7th note that you’ll need to fit into your chord shape. Sure thing! Take a look at the box on the right where you’ll see a handful of dominant 7th chords to try out. Remember, the dots tell you where to put your fingers and the numbers tell you which fingers to use. Black dots are root notes. That’s right. As we say, although the theory can be complicated, many of the shapes are no harder to play than major or minor chords. 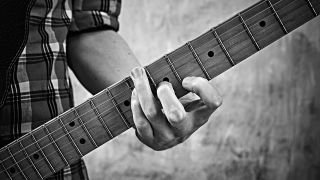 These chords have a tense, slightly edgy sound that makes them well suited to blues, so that’s a pretty good place to start. But dominant 7ths are found in all styles of music, from pop and rock to jazz and folk, so experimentation is the name of the game. Try out our tab example where you’ll find a selection of dominant 7ths in a folky ballad style. These chords are all built by adding the oddly-named ‘dominant 7th’ note to a basic major chord. Notice how each chord is a simple finger change to the major shape. We’re mixing up a few dominant 7ths here along with a C major chord. This is actually a classic blues progression used notably in Robert Johnson’s They’re Red Hot from 1937. There’s more of a folk vibe here though thanks to a slower tempo and a lighter strumming action.